Aid organisations play an unintended but crucial role in South Sudan’s repeating cycles of violence. How can they break out of it? Humanitarian aid often finds its way into militants’ hands and may help prolong fighting. Credit: Arsenie Coseac. Since war broke out in December 2013, violent crises in South Sudan have erupted and evolved in predictable ways. In these familiar patterns, rebels, the government and international actors all have their parts. They have played these repeatedly now for over five years. Typically what happens is that a new front to the conflict opens up when a group of disgruntled leaders in South Sudan form an insurgency. These individuals are often former government officials driven by their own ambitions rather than communal grievances or a genuine desire for reform. As fighting ensues and lives are lost, humanitarian agencies may report on the crisis in order to raise awareness and encourage donors to provide financial support for relief efforts. Eventually, mediators may step in to propose a power-sharing agreement in the hopes of ending the violence. If acceptable, the rebels return to government with more power than they started with. This cycle may begin again, with the same or different leaders, sometime down the road. In this repeating story, the international community has a key role. Its efforts may be well-meaning and aimed at alleviating suffering. But their susceptibility to manipulation by the warning parties produces unintended results. When there is a humanitarian crisis in South Sudan, relief organisations attempt to intervene by providing food, medicine and shelter. This is crucial, but without the right safeguards and planning, these initiatives can easily be exploited by warlords (and particularly rebels). To begin with, militant groups often find ways to seize humanitarian supplies that are then used to support their own war efforts. They may do this by infiltrating distribution centres and appointing supporters to steal food. Alternatively, they may simply take goods by force. Shortly after the war broke out in 2013, for example, the UN accused both the national army and rebel forces of stealing food aid and vehicles from humanitarian organisations. Some rebels also target camps to recruit new fighters including sometimes forcibly. Furthermore, warring parties often try to make the whole humanitarian presence seem like a gift to their support base in order to boost their own legitimacy and claims to be acting in the interests of the community. Just last month, President Salva Kiir branded the distribution 10,000 bags of rice, which came from Chinese food assistance, as his own gift to the people. South Sudan’s government has also been adept at taking advantage of humanitarian agencies’ reporting of crises. State officials have sometimes used alarming coverage of disasters to raise fears that the country is on the brink of collapse, an outcome international partners are united in trying to avoid. By drawing on this narrative of desperation – a ploy that’s been described as “playing the fragile state card” – the government can more easily manipulate foreign actors and appeal to international financial institutions for funds. This tactic was likely deployed, for instance, in persuading the European Union to start a programme that has paid $40 to 30, 000 primary school teachers each month since April 2017. Warring parties can also benefit from the humanitarian presence by turning to straightforward extortion. Fighters have imposed semi-arbitrary charges such as “sitting fees” and “airport fees” on relief efforts, while in March 2017 the government increased work permits for foreigners from $100 to $10,000 and ramped up registration fees for international NGOs from $2,000 to $3,500. Finally, a large humanitarian presence can be beneficial for warring parties in more indirect ways. Food aid helps keep the price of goods down, while spending by NGO workers helps keep certain businesses afloat. The international community’s response to the war in South Sudan has been lacking in many respects. As I argued previously on African Arguments, the typical diplomatic approach of trying to end the war by proposing power-sharing agreements is doomed to fail. This strategy rewards violence, ignores the root causes of conflict, and encourages dissatisfied elites to take up arms to whenever they want a bigger share of power and public resources. The recent actions of General Thomas Cirillo, who refused to sign the September 2018 peace agreement and who is now provoking further clashes with the government, is further evidence of the deficiency of this approach. Mediators must recognise the weaknesses of this approach and acknowledge how it has contributed to ongoing cycles of violence. At the same time, however, humanitarian actors must confront their own role in this complex system too. They must examine the many ways in which their presence may provide support for warring parties and help prolong the conflict. It has reached the point at which militants are not only skilled at exploiting weakness in the system opportunistically, but actively seek to mobilise humanitarian interventions as a strategy of war. Ending this manipulation will require new ways of operating and clearer systems to guide the flow of humanitarian assistance. Among other things, this could involve international monitoring of inflows by UN forces as well as strong mechanisms to punish those who exploit or abuse relief efforts. It will also have to include measures to prevent the government delegating service delivery to international donors while being reckless with domestic resources. This might mean imposing strict end dates for international donor support after which the government must resume funding sectors such as education and health, which are currently being kept afloat by the US, Sweden, the UK and Canada. Finally, the nature of the humanitarian response must also be debated. 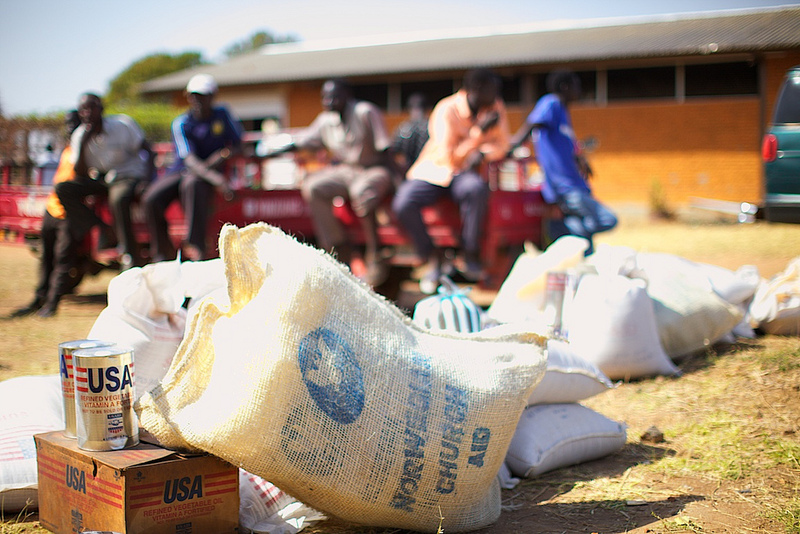 The kind of emergency relief typically deployed in South Sudan is both more susceptible to manipulation and less effective in long-term than support that would build resilience and self-sustainability. There are no easy solutions of course. But until the international community and humanitarian organisations acknowledge how their approaches are exploited and played by warring parties, they will continue to play their now clearly-defined roles in South Sudan’s repeating cycles of violence. *Daniel Akech Thiong is an independent consultant focused on politics and economics in South Sudan.